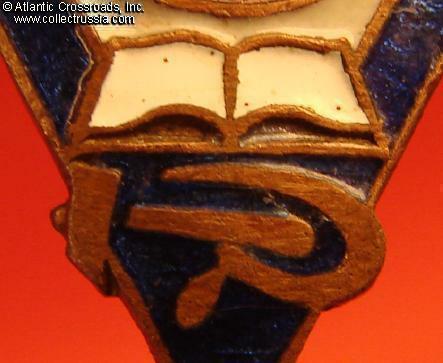 Trade Union of Higher and Vocational Education, membership badge, Type 3 (miniature version), circa late 1920s - early 30s. Brass, enamels; 31.2 x 16.8 mm. Well proportioned design is clearly influenced by Constructivist style, still popular through the late 20s. Note a very unusual, compressed depiction of the hammer and sickle emblem, at the bottom. The Cyrillic cipher in the center is the abbreviation of the trade union, "SRO". 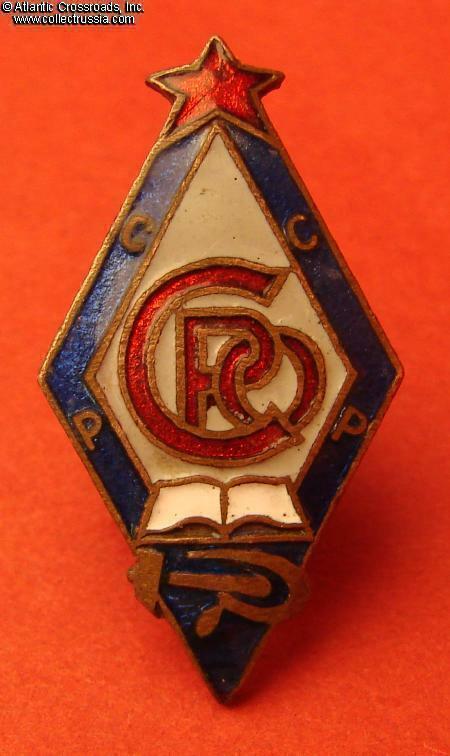 Note that the last letter stands for "Obrazovanie" or higher and professional education, as opposed to the Cyrillic "P" (for "Prosveschenie") found on the more common membership badge of the Union of Education ("SRP"). The latter included teachers and employees of the grade schools and child care facilities, whereas members of the SRO included faculty and staff of universities, colleges and vocational schools. In very fine to excellent condition. 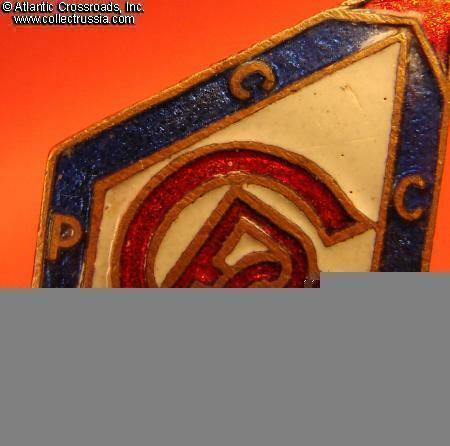 The enamel is nearly intact, completely free of chips, flaking or buffing. There are a couple of superficial scratches to the sky blue enamel in the upper portion of the diamond, not easily noticeable. The red star has a small hairline crack and a dark area, neither of which is very noticeable or detracting. 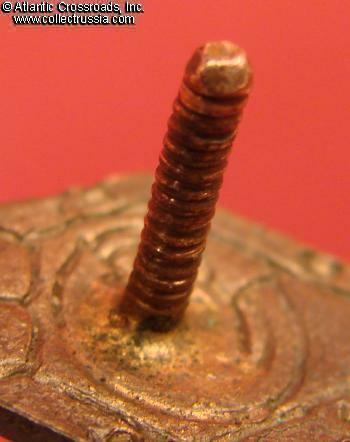 The copper screw post is full length, approx. 11 mm. 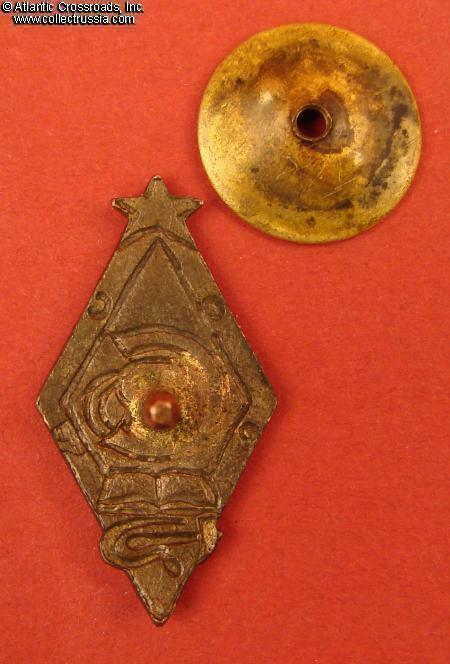 The unmarked screw plate is of the period and possible original to the badge. /See "Avers 8", p 277, fig. 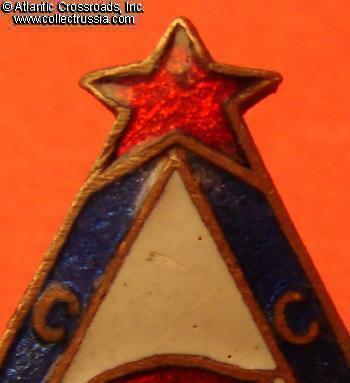 1356.c (note that the badge is described but only the full size version in silver, 1356.a is actually pictured in the book), also "Breast Badges of the USSR of the Era of Labor Victories, 1920-1940", p. 201, top (misidentified there as Trade Union of Education or SRP)/.